Located approximately 90kms north of Phuket, and 1 km from the destination's centre, Khaolak Paradise Resort is at the southern end of the coastline adjacent to the National Park. Considered to be one of the quietest and most beautifully landscaped of the resorts in the area, Khaolak Paradise Resort prides itself on its friendly service and international standard facilities. A jungle-clad hillside rolling down to the beach, backed by mountains and surrounded by nature, is the setting for Khaolak Paradise Resort. 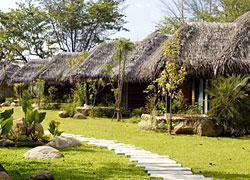 Paths and wooden walkways weave through the greenery with the sounds of birds and nature all around. A wide range of activities and tours are available in the surrounding area, and can be booked through the resort's front desk. The famous Similan Islands, voted one of the best 10 dive sites in the world, are just a short boat trip away and are a great place to go snorkelling and swimming. Elephant trekking, waterfalls, jungle trekking, Phang Nga Bay and canoeing are just some of what is on offer. 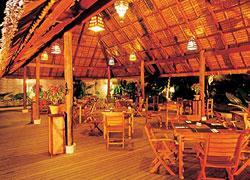 The beachside restaurant, Leelavadee Dining, caters throughout the day. 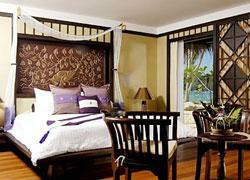 An a la carte menu is offered for lunch and dinner with Thai delicacies and international dishes. You can choose to sit inside under the palm roof, sala-style, or outside on the beach, under the stars. Wherever you choose, you will be bewitched by the hues of red and orange as the sun sets into the Andaman Sea directly ahead. 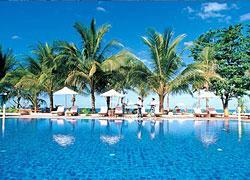 The swimming pool is the centerpiece of the resort, next to the beach. Wooden decking around the pool, son chairs and parasols, ensure and idyllic spot to bathe in sun and cool off in the pool. The poolside bar serves snacks and refreshments throughout the day--no need to leave the comfort of your sun chair. 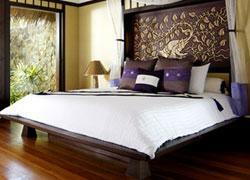 Dotted throughout the sprawling grounds are 30 rooms, a mix of deluxe and villas. Made from local materials and with palm-covered roofs, all are designed to blend in with their surrounds and are part of this unique environment.